/ Modified mar 14, 2014 6:19 p.m.
Gov. Jan Brewer dedicated much of last year to promote the benefits of expanding the state's Medicaid program - Arizona Health Care Cost Containment, or AHCCCS. Brewer signed the legislation into law June 2013, and the expansion became effective in January, giving thousands of uninsured Arizonans the chance to get health coverage. Since the law was established, El Rio Community Health Center has been helping many of its patients apply for Medicaid or health insurance under the Affordable Health Care Act. And, according to Celia Hightower, El RIo's chief financial officer, they've been "very, very busy." "That is good...amen for that," she said during Friday's broadcast of Arizona Week. "We have seen patients coming in and applying. They started applying in October, but knew their application had to be on hold until Jan. 1, when (Medicaid expansion became a law)...when they come in with their letters saying they have been accepted, it is the happiest day for them." Many of the people Sandra Leal, pharmacist at one of El Rio's clinics, meets have diabetes. 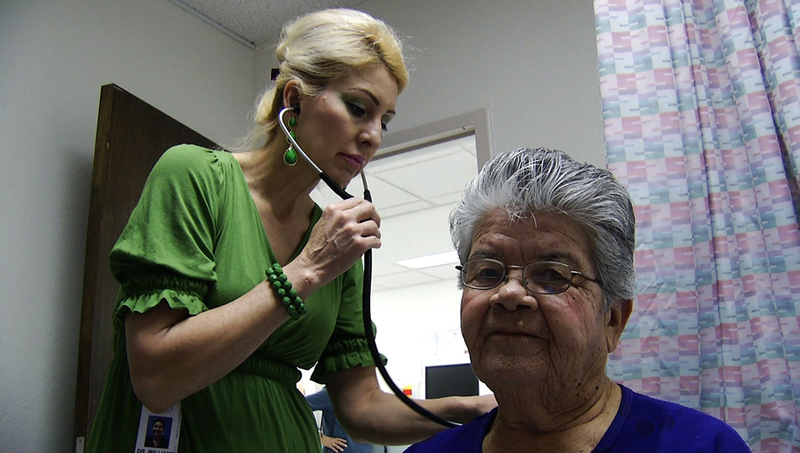 She said, since news of the Medicaid expansion, many of them come in relieved because they can now afford the more extensive diabetes care El Rio facilities are unable to provide. "Diabetes is very expensive," Leal said. "Aside from the illness...there are multiple medications people to take...they have to go see the eye doctor once a year...foot doctor...lab work done, and then the supplies, testing supplies to make sure they are eating the right food. They have to make a choice between paying for the doctor or paying for their grocery bill..."
But even if patients don't qualify for coverage, El Rio offers discount options for their primary medical care. However, the issues come when patients are in need of more serious care. With no coverage, and little to no extra money from paychecks, many of El Rio's patients would put off seeing specialists, such as a cardiologist or neurologist, and delayed treating more grave health problems, according to Hightower. Since news of the expansion, the health center has focused on community outreach to ensure residents are aware of possible benefits they could now qualify for, Hightower said. "We will take care of patients whether they have insurance or not...even if you make not qualify for Medicaid expansion or the market exchange, it is important that you at least come check," she added. "We want to make sure those benefits get to you and your family." El Rio was awarded a grant recently, which allowed them to hire six application counselors, giving them a team of 11 to help patients apply and then enroll for Medicaid. "We are also doing fairs on the weekends, promotion to make sure people exactly what this means now, what the law means now," Hightower said. "If they don't have the knowledge, they may not apply, and we don't want them to go without a service they qualify (for)."